I’ve started the layout for a new painting. 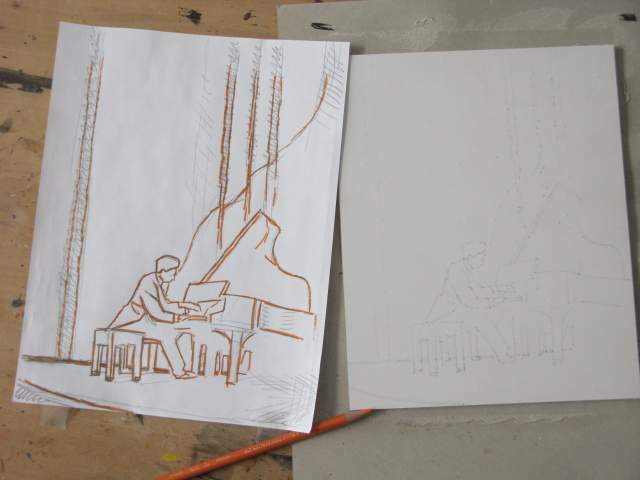 It’s based on an old thumbnail sketch I made several years ago of a friend playing a composition by Franz Liszt on piano. The original sketch had a horizontal layout, but I decided to go with a vertical arrangement instead. I enlarged the sketch to an 8×10 inch size, and transferred the outlines to a plaster tile (see my previous post on Permastone.) The homemade transfer paper isn’t shown, but you can also see an old post I made about that here. The orange pencil helps tell me where I’ve already drawn my transfer lines. I’m planning this to be another gouache painting.